Carlos Ghosn says China will save the electric car, really? 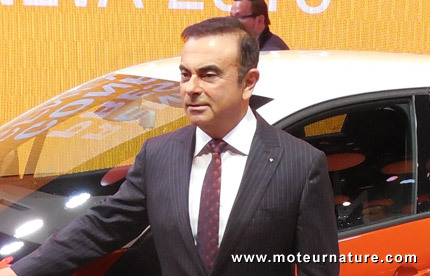 In an interview, Carlos Ghosn, the Renault-Nissan boss (pictured at the Geneva motor show, earlier this month), spoke enthusiastically about China. In Europe or America, EV sales are still modest, and their market share, if growing, remains very low. M.Ghosn doesn’t comment that, he rather talks about his hope for the world’s largest car market: China, which should become an Eldorado for electric cars. We’ve heard that before. Several times actually, but so far, those great expectations have failed to materialize. There will be many EV concepts next month at the Shanghai motor show. Just as last year, and the year before. BYD has been saying since 2010, that’s its E6 model (an electric minivan) will soon be mass produced, and that it will make thousands of happy drivers all over the world. But 90% of BYD E6 drivers today are Chinese taxi drivers who have been told to drive one. We would like EVs to be successful in China, with hundreds of thousands of Chinese people getting one, but despite numerous announcements, there is no hard data to show that this is about to happen. There were more new cars sold in China than in the U.S. last year, but there were more electric cars sold in America. M.Ghosn knows that, his expectation is that because of severe pollution problems, China will regulate, and force people to buy EVs. He doesn’t give any details about that, and there’s none we are aware of, but there are already substantial financial incentives for Chinese drivers to get an electric car. Something stronger might be on the way, and it’s very true that pollution problems are only getting more and more acute in China. But would Renault be ready to take advantage of it? Right now, the Renault brand is lagging in China. It signed a partnership with Dongfeng, but an electric car built in China for the Chinese market is still at best two years away. Everybody remembers that a few years ago, Carlos Ghosn said that EVs will get a tenth of the market by 2020. High hopes back then, and high hopes again for China. Maybe EV fans should have more modest goals. The electric car must be able to live, and be sustainable, making modest sales.